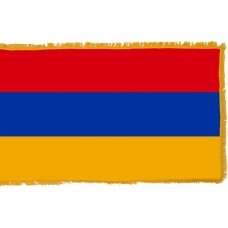 The Armenian flag consists of three horizontal bands of red, blue and orange. The red represents the 1,500,000 people that were killed during the Armenian Genocide, the blue symbolizes a pure sky and the orange color represents the courage of the people and Armenia. Throughout history, there have been many variations of the flag as different designs were adopted depending on the dynasties. In fact, historically, wooden carvings of animals were mounted on poles and used as a symbol of the country. 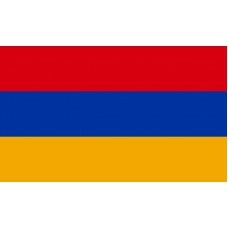 In 1918, Armenia became independent and on August 1st, 1918, the national flag was adopted until 2nd April 1921. In 1920, two years after becoming independent, Armenia was invaded and became a part of the Soviet Union and was a republic of the Soviet Union until 1991. The first Armenian SSR (Soviet Socialist Republic) flag was implemented in 1936 and held a strong resemblance to the Soviet flag. It changed again in 1940, followed by another change in 1952. When the Soviet Union collapsed in 1991, Armenia, once again, became independent and re adopted their national flag. The Armenian flag represents the country's history as well as hope and good fortune. The color red on the flag symbolizes the bloodshed in the horrific massacres during the Armenian Genocide. The Armenian Genocide which is also known as the "Armenian Holocaust," and the "Armenian Massacre," refers two events. In 1915, 300 Armenian leaders and intellectuals as well as 5,000 Armenian civilians (Mostly the poor) were killed by officers as they wanted to completely remove the Armenians from Turkey so it would become a fully Islamic and Turkish country. The second event was during World War 1, when the Young Turks government was ruling Turkey, they ordered for 1,750,000 Armenians to be deported. During this process, hundreds of people died either from starvation or disease and 6000,000 or more were killed by the military. 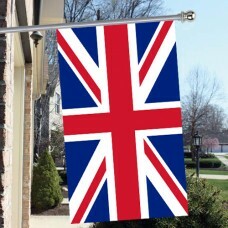 Throughout the country's history, it has been conquered and ruled by so many different countries, which is why the flag that represents their independence holds such great meaning and significance. In the constitution of the Republic of Armenia, it officially states that: "Red emblematizes the Armenian Highland, the Armenian people's continued struggle for survival. Maintenance of the Christian faith, Armenia's independence and freedom. The blue emblematizes the will of the people of Armenia to live beneath peaceful skies. The orange emblematizes the creative talent and hard-working nature of the people of Armenia." Armenia is a landlocked country that shares borders with Turkey, Iran, Georgia and Azerbaijan. Its capital city is Yerevan, which is 2700 years old and is one of the oldest and still occupied cities in the world. It is home to many ancient buildings and museums, describing the countries tragic history. Adopted in 1990, the Armenian flag uses a tri-colored pattern using red, blue and orange. Blue stands for the skies and hope, orange represents the blessings of hard work, and red recalls the blood shed during the struggle for independence. To the free, independent Armenia. And bathed in my tears. 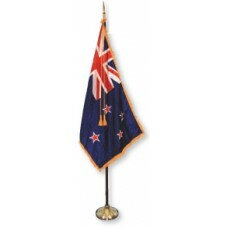 A valuable symbol for us. Let Armenia be glorious forever.